5th FRIDAY IN NOVEMBER BECAUSE OF THANKSGIVING!! NOTE: No gong bath at this venue in December because of the holidays!! THIS WILL BE A HOLIDAY FUNDRAISER FOR THE RI FOOD BANK! YOU RECEIVE A RELAXING GONG BATH PLAYED BY JOY & SHAWN , JOINED BY VARIOUS OTHER SOUND HEALERS, WHILE THOSE IN NEED GET TO HAVE FOOD FOR THE HOLIDAYS! IT’S A WIN-WIN!! Join us at our spacious venue on Esten Avenue in Pawtucket! It’s a ground-floor, easily accessible, air-conditioned space with some couches and comfortable chairs around the walls and plenty of parking! 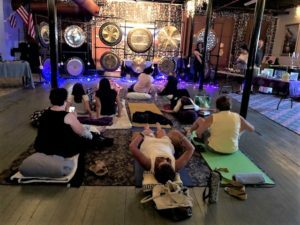 Joy (Gongs of Joy) and Shawn Aceto (Master Sound Healer) are your guides for this harmonic journey, along with some of their gong playing friends! Donation: $30 – All monies will be collected at the door – cash, check or credit cards happily accepted! All proceeds from this event go to the RI Food Bank! Bring a mat/pillow/blanket or folding chair…whatever you need to be comfortable sitting or lying on the floor. Please contact Joy ahead of time if you plan to come so we can properly plan on the space!